The 2016 LA Auto Show is in town and we got advanced tickets, so sit down and enjoy DT's voyage through the halls of the LA Convention Center. Highlights include a life sized tie fighter, Fez from That 70s Show introducing some econobox from Toyota or Honda (I forget) and the other typical things you'd expect at any auto show (cars, free junk, booth babes, et cetera). Ed Vince -- If you have no interest in reading through my gibberish, you can go directly to this flickr album and just look at the eye candy. Nissan has been following Mitsubishi in the inevitable plug into obscurity/bankruptcy by spending engineering/marketing efforts on their bland garbage for the masses, and ignoring their sports machines, but they really delivered at the auto show with an awesome Star Wars themed booth. Its a darn shame Nissan doesn't sell an actual X-Wing fighter, because the Rogue is basically an ugly Kia if you ask me. The Japanese automotive industry started in earnest about 50 years after the British auto industry and I have to wonder if it will implode in similar fashion in the next few decades....who knows. Buick delivered an interesting concept car right smack dab in the middle of their fleet of unremarkable and basically forgetable sedans. Remind me again how Buick survived the carpocalypse and Pontiac, Oldsmobile, Mercury, & Lincoln didn't make it....oh yeah...China. Forgot about China again. 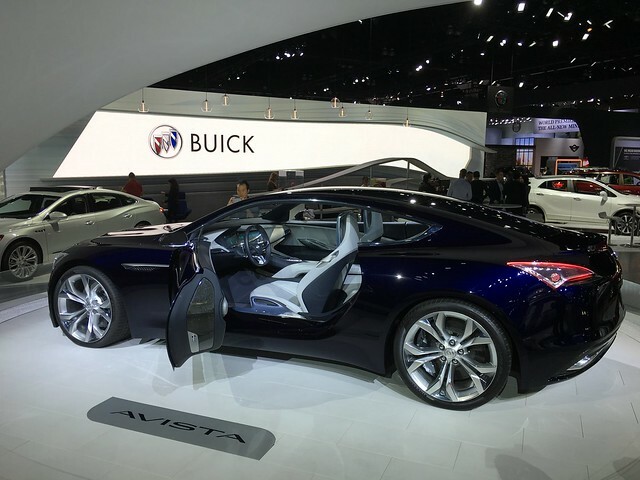 The rear end of the Avista was striking -- no doubt it will be neutered into some rice water flavored pablum for the masses before it hits the show rooms...wait...I'm getting something through the time-space-web continuum. Some reader is yelling at his keyboard that Lincoln didn't die in the carpocalypse. Really? What do you know? Lincoln is still alive and building cars out of Ford factories -- this is some concept built on an Expedition or Explorer chassis -- it will be very boring when it gets released? The modern Lincoln's grill is such an indescript piece of plastic -- it was as if someone paid a group of designers to make a car grill based on an amalgam of all other car grills. And then in the end they chromed it. Done! Moving on from the land of the lost, I wandered into the Ford booth where I was greeted by Ford's V6 EcoBoost powered GT LeMans racer and...yes...drool...a REAL 1966 Ford GT40. This is chassis P/1046 driven to across the finish line at 4PM in 1966 at LeMans by Bruce McLaren and Chris Amon. Sitting next to it was the 2016 LeMans winner, still caked in grime/dirt from the race. Speaking of mid-engined supercars that seem to take forever to get into production...here is yet another picture of the Honda NSX supercar. Retro wheels seem to be making a comeback, and these things were sitting on some Maybach Mercedes. And this set of wheels, straight out of Tron were on some kind of Honda sport utility thing -- a CRV or HRV or RRV or some other meaningless three letter abbreviation. 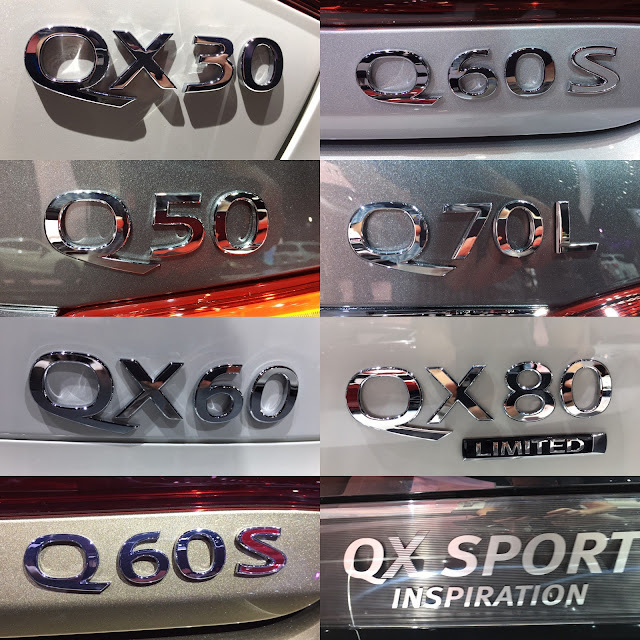 Speaking of meaningless alphanumerics designed by hapless Morlocks -- what a quixotic quandary the guys at Nissan's Infiniti brand have gotten themselves into with their latest naming convention. From what I can tell liters of displacement have been replaced with a Q and then the average age of the buyers. One company that does get naming with alphanumerics done correctly is Mazda -- no one is going to confuse an MX-5 with an RX-5 or CX-5 -- my only complain is that the Mazdaspeed 3 name is ambiguous -- is it a Mazda 3 Mazdaspeed or Mazda Mazdaspeed3 or Mazda Mazdaspeed 3...you get where I'm going. The red paint on this CX-5 was delicious and would look great on something like a sports car. Of course Mazda brought a tie fighter to a knife fight with this Mazda RT24-P Daytona prototype that will race in the DPI class in the IMSA WeatherTech SportsCar Championship. If you understood the words in that previous sentence...you might be a gearhead. An anonymous commenter asked for pictures of booth professionals and FTB asked for photos of the new Jeep Grand Wagoneer...so here is a twofer. GlennB asked for pics of the mid engine 911 RSR racer and this thing was awesome looking in person -- I just wish they'd have fired up the engine once in the while. Static car shows are lame. A trip past the Volvo booth revealed an almost life-sized moose sculpture that was being scanned by a moose avoidance/identification system in the new S90 -- one can only hope they will have a redneck version that tells the driver if the moose is in or out of season. Outside of the main convention halls you start to find some oddballs, such as this 6 passenger first generation Ford Mustang convertible...but things get stranger in the basement. For the most part the basement is filled with hideous Lamborghinis and McLarens that prove that money can't buy taste -- but then I stumbled upon these custom things that are on display from the builder for some reason that wasn't clear to anyone else. If you look at DT's flickr album you might have noticed a large number of photos of engine cut-aways -- these things littered the halls of the main displays and are really cool if you are an engineer, or engine geek. The X-Wing was so awesome that I had to include another picture. Nobody seemed to know why Ford had a HUGE display of almonds and almond shells in their area -- perhaps they wanted something that was more nuts than introducing another turbocharged gasoline engine with the word "eco" in the name. Speaking of nuts -- the BAC Mono was the most nuts road legal car at the show. If you want to see all of the DT photos -- click on this link here. The X-Wing is awesome. I'm a huge fan of Star Track. Too bad most of those engines will be covered under Tupperware. 200 engine cutaway photos, 80 cars, and only 2 booth professional photos. Hmmmmm. The DT Gear Nerds view of the show? At least trhe ladies were live and not static. What happened to you guys? Off topic: Did you watch The Grand Tour? What did you think? I personally couldn't sit through half of it, then again, I was not a big top gear fan. I personally am not interested in "super car" reviews and challenges, and the whole episode was about cars with insane amounts of power. Too much vulgarity as well. Mazda took away the DPi after press day! I like the Triumph Stag. That was a cool car, and with the 350HP engine it probably goes fast. The design was what got my interest. Usually the show cars are all alike. Someone said the Stag was actually from the 70's It looked brand new and epic cool.